Sometimes you have a major “hiccup” . . . and we definitely had one! The log cabin that we’re building at Artesian Lakes in Romayor, Texas has been a learning experience since we decided that we wanted to build our second home. The workmen are digging out the square holes for concrete footings for the log cabin. Some of the square holes for the porch are 2.5 feet wide, while the others for the main cabin are 4 feet square. The size was determined by the engineers so that there will be enough strength to support the weight of the house. While this home is being built on mostly sand, there is a little clay in the mix. 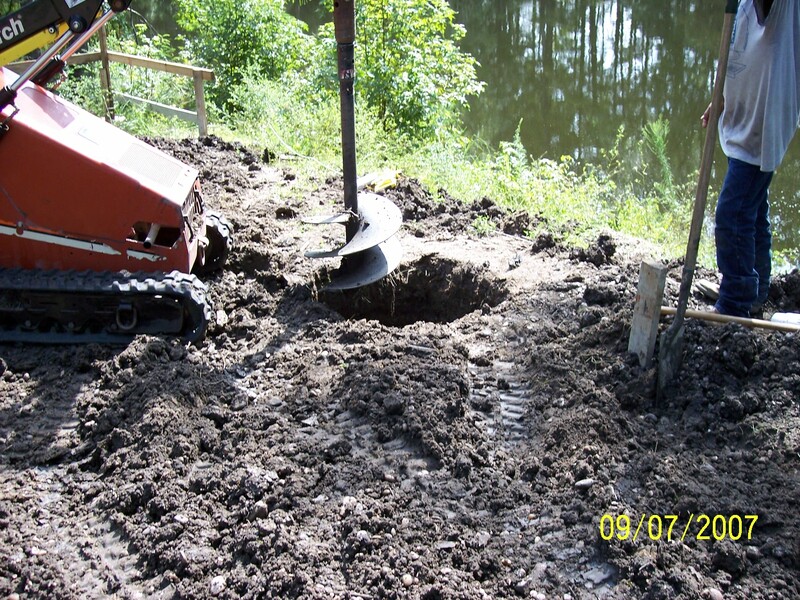 The holes which have been dug in this picture are the smaller ones. 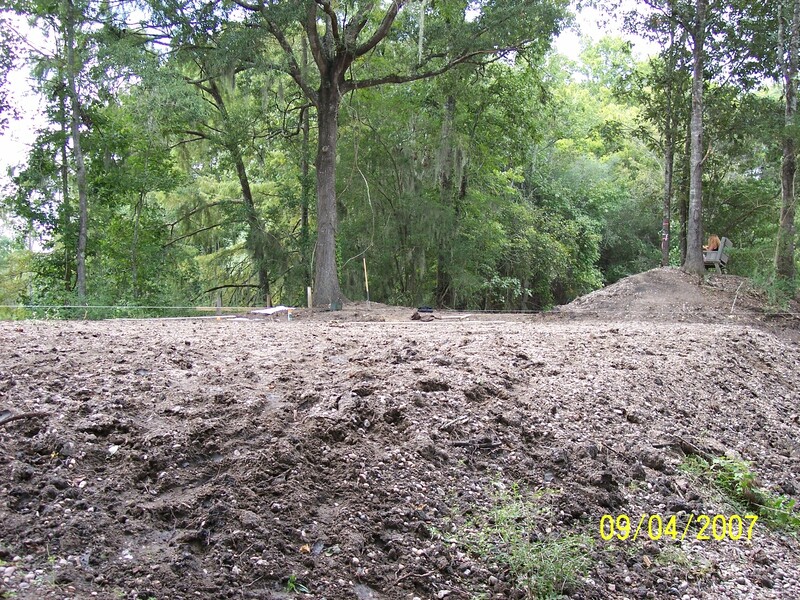 The footings here will support the covered deck. 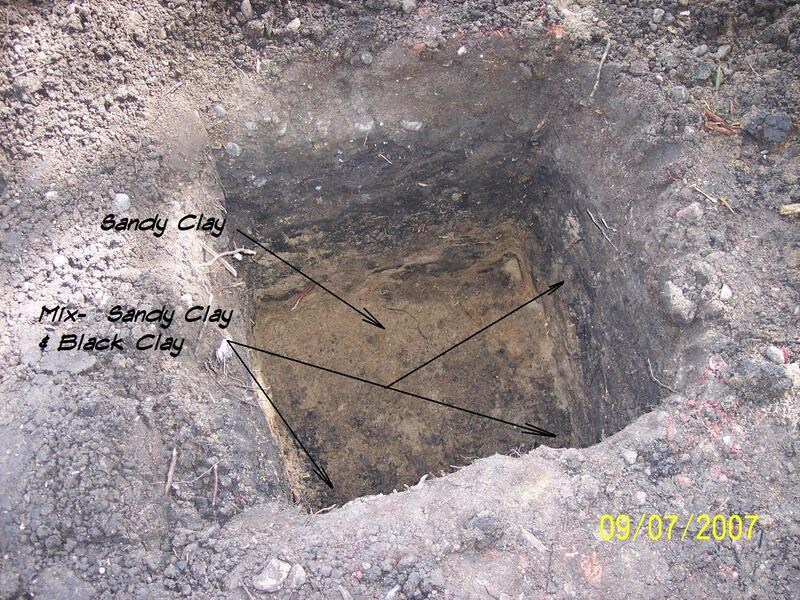 Here is another hole depicting a clay presence . . . which is a “good thing”. A tool was used to drill out some of the dirt for the square footings. Then the holes were further shaped by hand. The ground was spray painted so the workmen could tell where to place the footings. Again, this picture shows how the holes were partially drilled out before the workmen hand shaped the square holes. 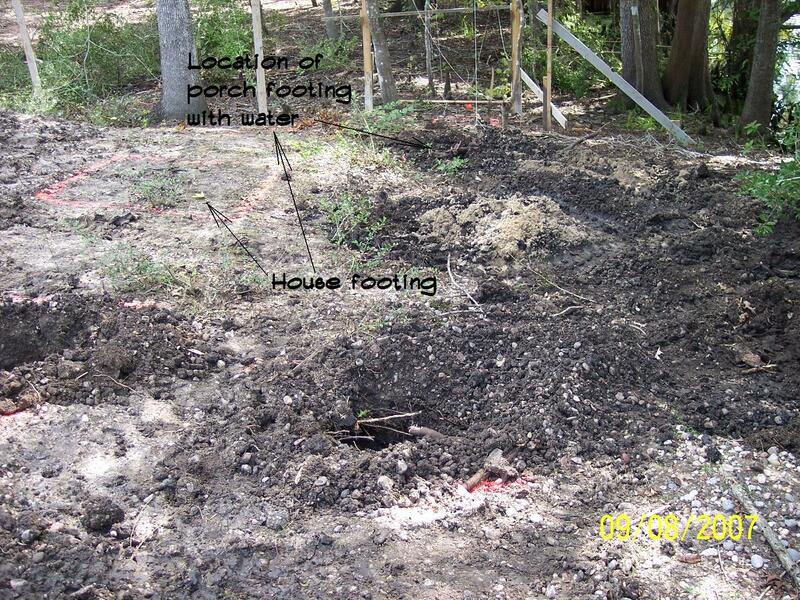 House footings in comparison to one of the footings that hit water. This is where we had our first big “hiccup”. The majority of the holes were dug. Then we hit water. 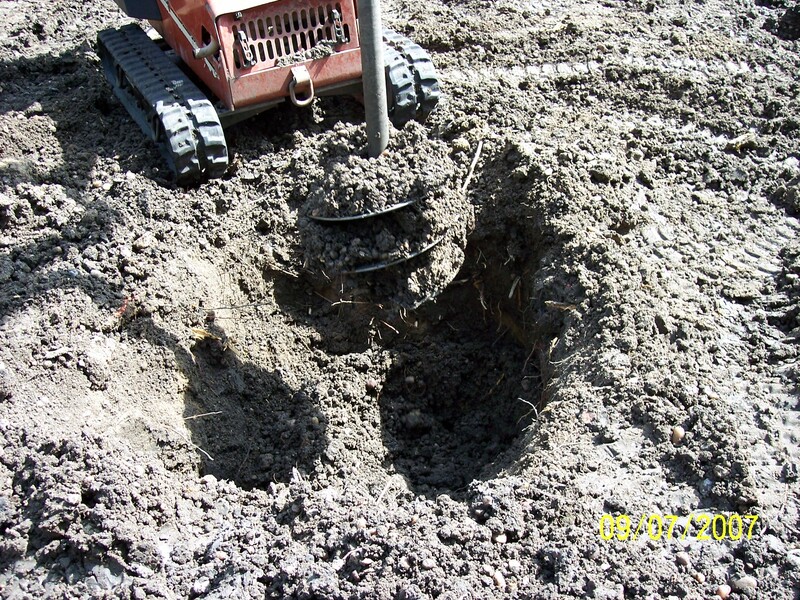 This is a major problem when you’re putting in footings. We had to stop operations altogether. It was time to contact the engineer to find out what to do next. Long story short . . . we could no longer put in footings. We had to completely redo the foundation plan. Bottom line learning experience . . . make sure your engineers actually go to the property and actually look at the relief of the place you intend to build. It will help them tremendously in figuring the right kind of foundation. No assumptions can be made then. 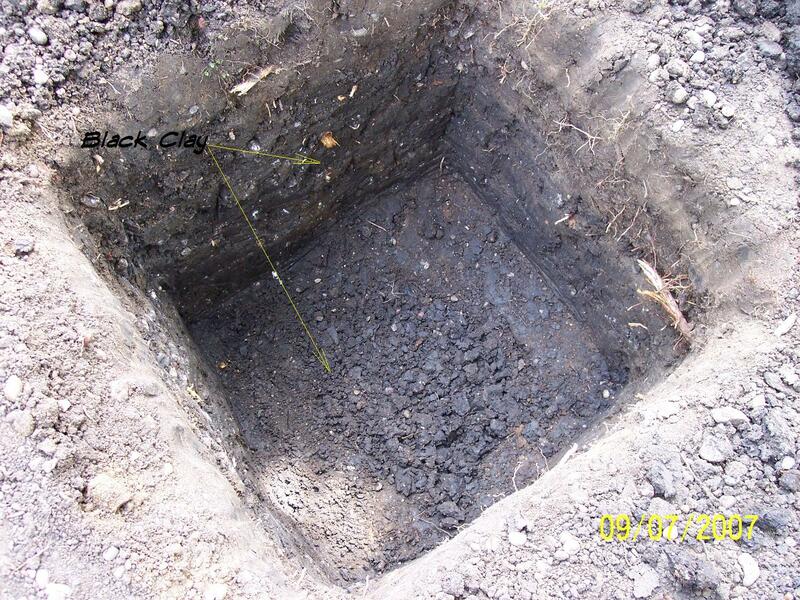 The architectural engineers should not rely solely on the soil samples. 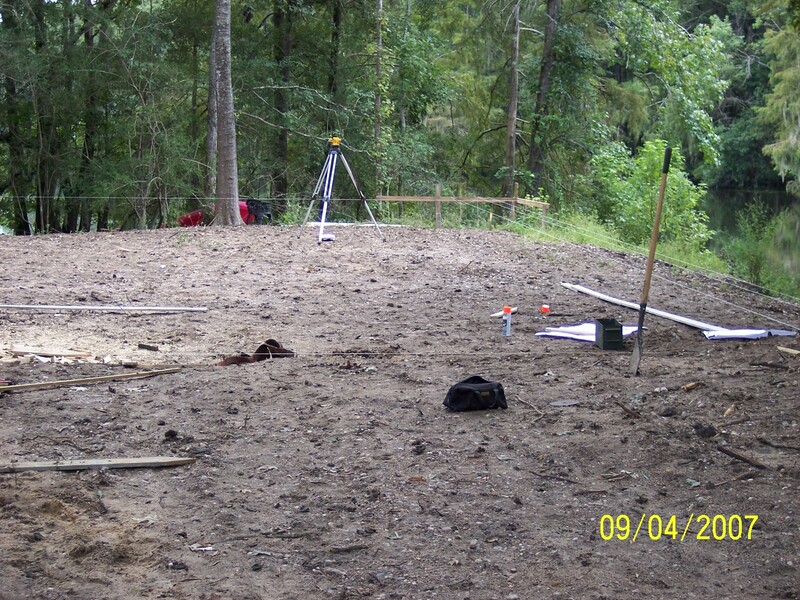 Only 2 soil samples were taken on this site. Neither were on the low side of the building site. This was a very costly mistake. Please learn from our experience. We don’t want it to happen to anybody else. Anyway, we shut down operations for about a month while the architectural engineer redesigned the foundation. The new design called for 35′ and 40′ pilings to be driven into the ground. Yes, I’m talking feet and not inches. I”ll update you more when I have more time to continue this picture story. 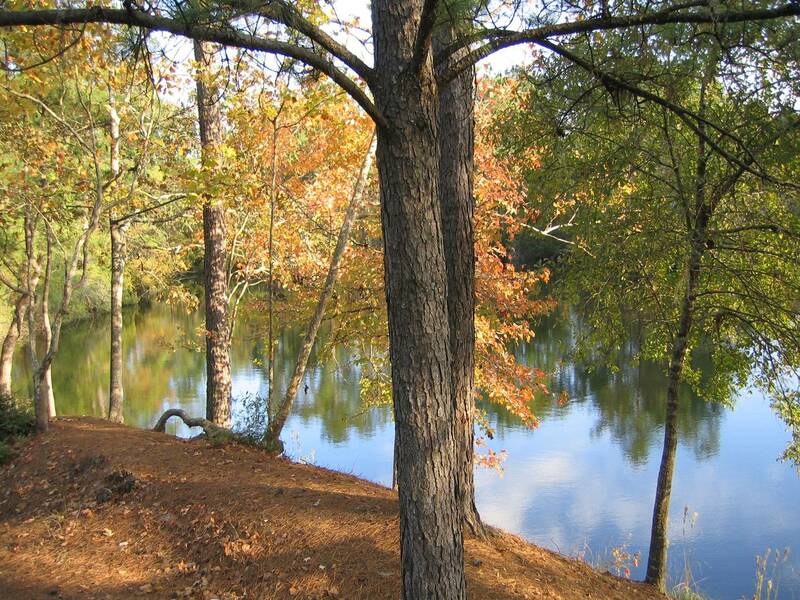 Our log cabin will be located in Romayer, Texas at Artesian Lakes. 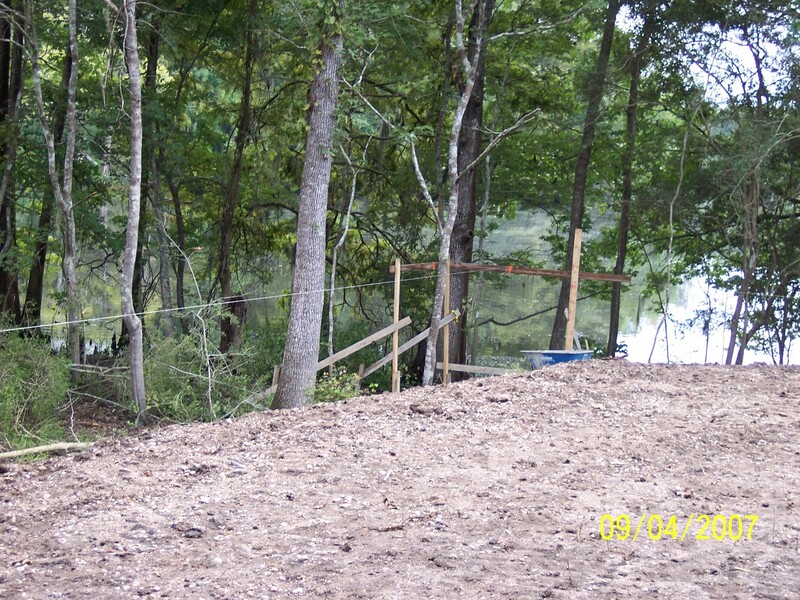 Jim and I call our building site Zoller Point since it is on a point with the lake on a little more than two sides. This will be a second home for us. 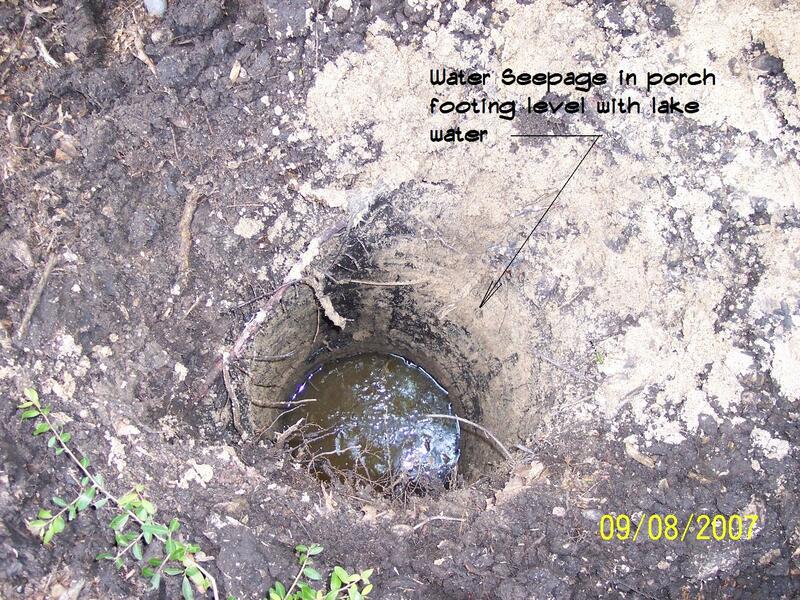 The site was leveled at an angle so that rain would runoff toward the lake. I insisted on keeping my little hill in the top right of the picture. Right now I have a bench up there so I can sit and watch what goes on. 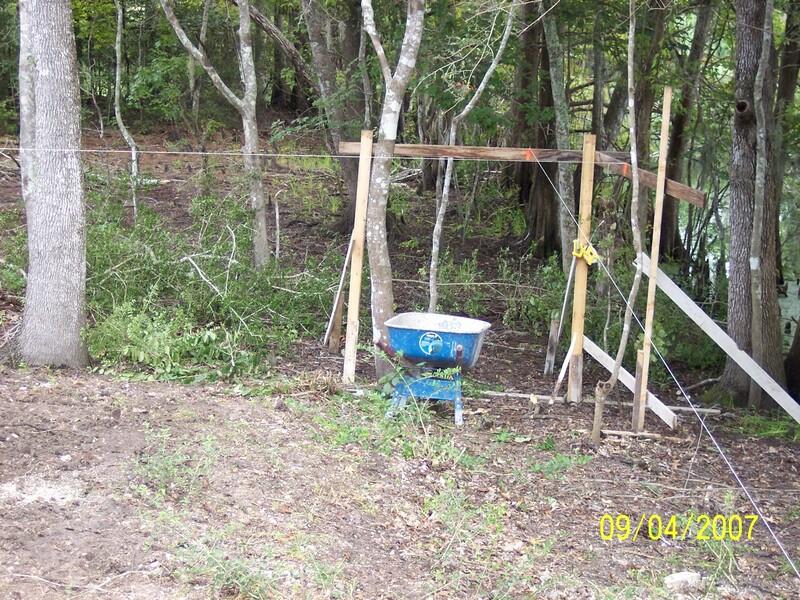 This area was cleared of underbrush so that we can have a place to set the logs, lumber, trucks, cranes, etc. when they come to the location. One of the workmen is at the northeast corner of the future cabin. Lines are being run to show the perimeter of the cabin. The boards depict the southeast corner of the cabin. More lines are being squared off for the foundation. And yes . . .that is water in the middle of the picture. 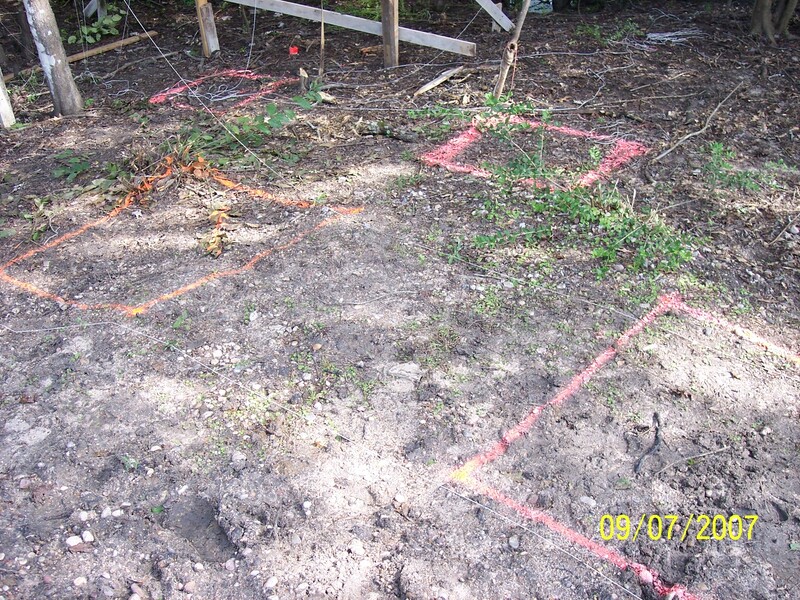 The lines are surveyed and the orange paint will be used to mark the location for the piers. 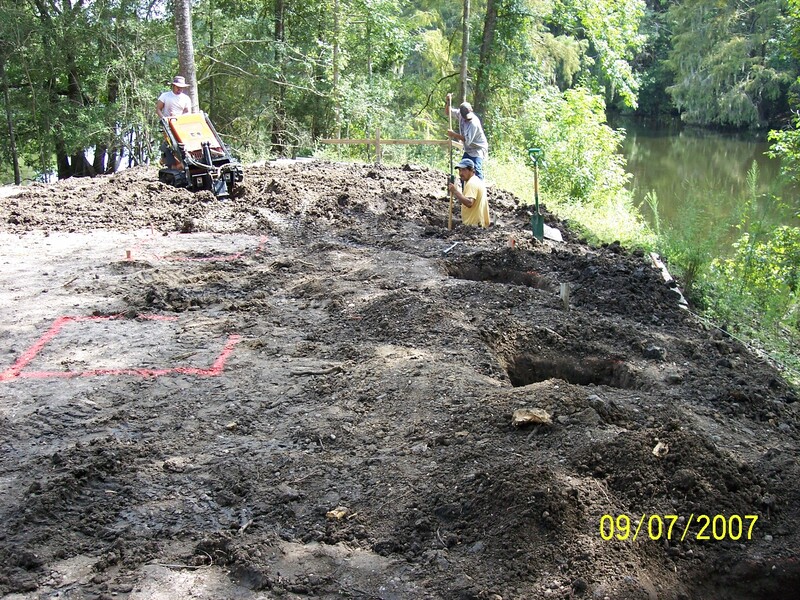 One of the workmen is assisting in the foundation layout on the northeast corner of the cabin. I can’t believe work is actually starting! We’ve waited for so long. Log cabin magazines, floor plan books, internet, trade shows, log companies, email, book stores, owners of cabins, builders . . . it is unbelievable how many places there are to look for the perfect plan to build a log cabin. I guess I just never realized that many people were interested in building a log cabin. Wow . . .I was wrong!! I think I own every log cabin magazine that has been published in the last couple of years. I’m not talking 10 or 20 . . .I’m talking at least 100 without going in and counting them. If a floor plan book had a log cabin plan in it anywhere (even if it was just one), I probably own it too. Looking at log cabin plans on the internet was fabulous. It kept me up into the wee hours of the morning almost every single night checking out every room size, the location of the kitchen to to family room, any wasted space, locations of windows, etc. I emailed or called every log cabin company that I could find asking them for information on their stock plans. I now have crates of those advertising materials. I called log cabin owners to find out their pros and cons of building their log cabins and what they would do differently if they could do it over again. I spoke to builders to find out what their thoughts were about building and some of the best plans for our area of the country. The wealth of information is OVERWHELMING!! I poured over all the information I had time and time again. My husband told me I was obsessed . . .and I was. We started looking at building a cabin around 1500 square feet. I thought that would be pretty easy. HAHAHAHAHAHA!! There were things that needed to be taken into consideration for the intended purpose of the cabin. My husband, Jim, and I wanted our two daughters to bring their friends . . .and eventually their husbands and children to the cabin. Therefore, we needed space for all of us that would eventually be staying there at any one time. We wanted our parents to visit and for them not to have to climb stairs. We wanted a kitchen that was slightly out of the way, but open to the dining and family rooms so that the “cook” never missed out on anything that was going on. It had to have a loft overlooking the family room and a fireplace and a lot of windows for the tremendous views and on and on and on. Of course, we wanted to be right on the water so the “great bass and catfish fishermen” could throw their poles in from the deck whenever they wanted. Our 1500 square foot cabin GREW. Before we knew it . . .it was a large home. The dream cabin grew to become a dream log homewith over 3000 square feet . . .and that didn’t include the covered wrap around porch. It needed to have 4 bedrooms (two up and two down), 3 bath rooms, the over-sized family room, a dining area, a breakfast bar, the loft and the covered wrap around deck. I continued reviewing plans with the intent to find something similar to what we were dreaming about. Well, I’m going to try and make this l o n g story a bit shorter. I had actually seen my dream home in the first log company book that I had seen. It needed some tweaking, but I really, really liked it. Figures, huh?!?!?! My husband would have liked to have saved the hundreds of dollars spent on magazines and books. BUT, you have to understand . . .I had to make sure it was the right plan for us. That’s one of the reasons why I had to keep looking. The other reason I had to keep looking was because it was going to cost a lot more to build than we had budgeted for. I didn’t realize dreams had to have budgets to come true. I guess I better stop here for right now. It’s late and I need to tell you the next step in my next blog. 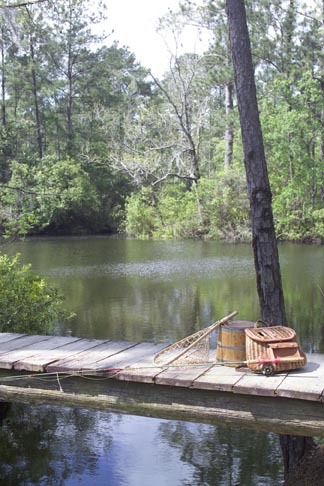 Anyway, if you want to know more about our dream cabin, or need information on the continued log home development at Artesian Lakes in Romayor, Texas . . . I am here to help you. Someone just asked me where Artesian Lakes is located. It is actually in a town named Romayor, Texas. Since very few of you probably know where that is . . .I’ll describe it’s location in more detail. I live in Bellaire, Texas which is very close to the Houston Galleria. When I drive to Artesian Lakes I get on the freeway from the west side of the 610 Loop and get on 59 North. I exit in Cleveland, Texas and get on 787 to get to Romayor(about 18 minutes). The whole drive takes about 70 minutes from the Galleria . . .if you’re not in rush hour. I still can’t get over the fact that in about an hour or so I can be out of the hustle and bustle of the big city life to a serene, heavily wooded area of East Texas on the edge of the Big Thicket. THe lakes are beautiful. One of the first things I do when I get there is to get my pole and do a little bass fishing. 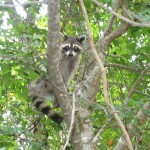 The birds, racoons, squirrels and other wildlife are fabulous to watch. Occasionally, I’m lucky enough to see deer. The country style dirt/gravel roads winding in and out around the lakes and trees actually lead me to the tranquil retreat that I so often desperately need. It’s peaceful!!! 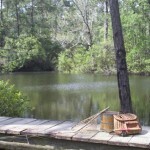 Of course I’ll continue blogging about this area since this is where we have started building “Our Log Cabin Dream”. If you would like more information on this fabulous area, please contact me. I have vast amounts of information available for your use. My husband, Jim, and I have taken our girls tent camping at Chain-O-Lakes Resort and Conference Center (now it’s named The Retreat at Artesian Lakes) since they were babies. We started renting the log cabins at the resort when the girls insisted they needed indoor plumbing. This has been our retreat for about 20 years or so. 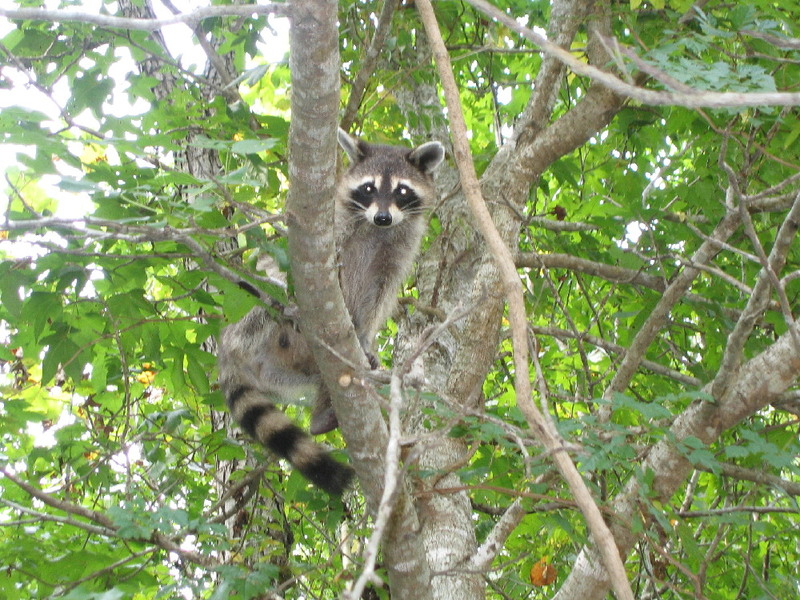 We used to sit in the porch swing on the cabin’s covered deck overlooking the lake watching the many different bird species, raccoons, squirrels and occasionally armadillos. The drops hitting on the metal roof would mesmerize us when it rained. 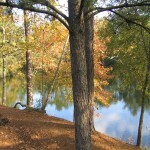 The actual beauty of the East Texas forest is so gorgeous and makes our way of life so tranquil. The relaxation has always been awesome! Jim and I would often comment that we should ask the owners of the resort if we could buy one of his cabins for our own use. It was a dream of ours to someday own one. Then a couple of years ago when we visited the Hospitality House of the Resort, we noticed a computer on the desk showing various lots for sale. There was a map on an easel showing where the lots were located. We walked the lots, then called the owner, Dr. Jimmy Smith, and asked for more information. He gave us a full tour of the property. Jim and I knew right then and there that we were going to be buying one of the lots. After looking and looking at around 100 lots . . .we walked onto one that was perfect for us. 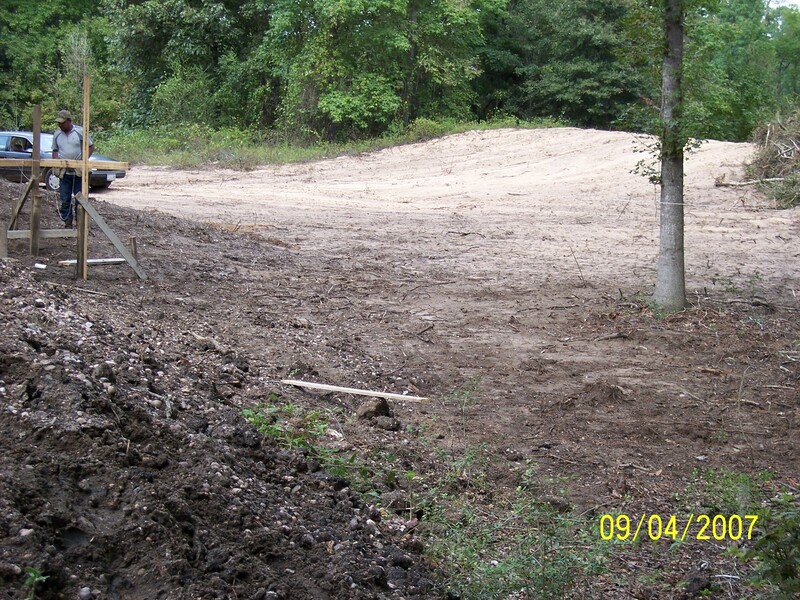 We wanted a lot of privacy, to be surrounded by as much water as possible and for the property to be heavily wooded. Our lot was different from any others that we had seen. It had oaks, fruit trees, pines, grapes, cactus . . . so many different trees. 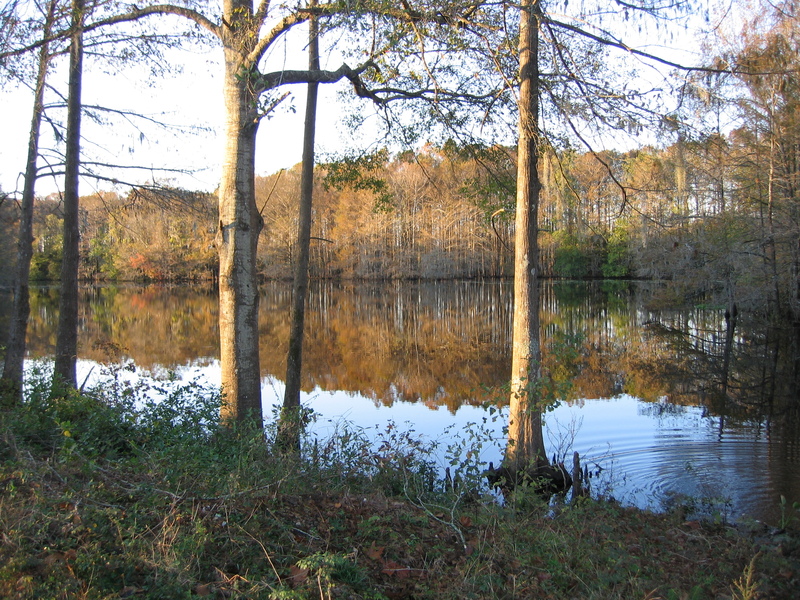 But what I think really sold us was the fact that not only did it have the look of the East Texas, it also gave you the eerie look of Louisiana swamps due to the cedar trees and the moss hanging from the trees. The huge white birds with wing spans of several feet glided over the water in a carefree manner that added to the feelings we got from being on this particular piece of land. Needless to say . . .we bought the land. That ended up being step one. I’ll tell you more the next time I get on line. Contact me in the meantime if you want to hear more right away. I’d love to hear your log cabin story . . .or your dream of having a log cabin. 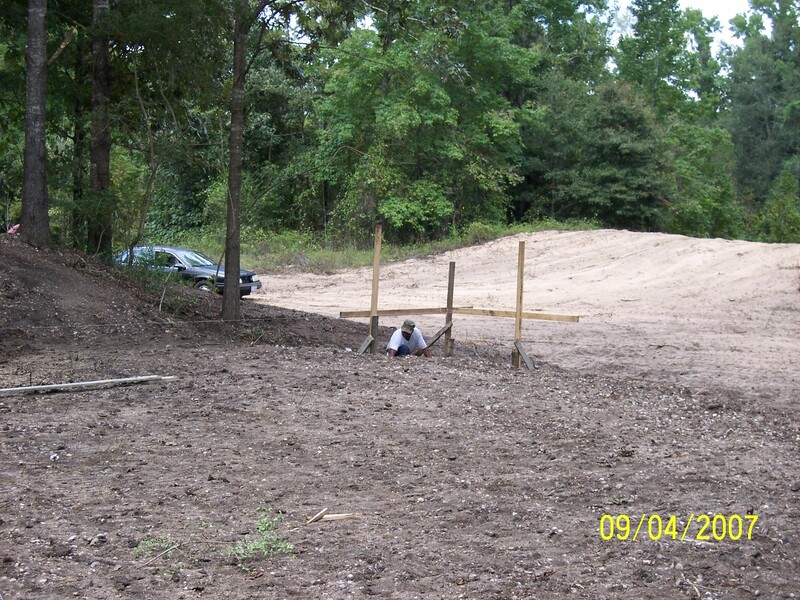 I am also marketing the lots at Artesian Lakes. Let me know if you would like further information on them.